Use the Business Asset Casualty or Loss Worksheet to keep track of business assets that no longer exist. Required by the government or IRS as proof of divesting yourself of business assets. step Proposal Pack is very easy to use and was a great investment, I landed 6 contracts within 2 months. Thanks, you guy are great." This Business Asset Casualty or Loss Worksheet is included in an editable format that can be customized for your own needs. How do you write a Business Asset Casualty or Loss Worksheet document? Time Period: Start Date - End Date. ASSET DESCRIPTION* DATE of LOSS COST of ASSET REASON for LOSS TOTAL. 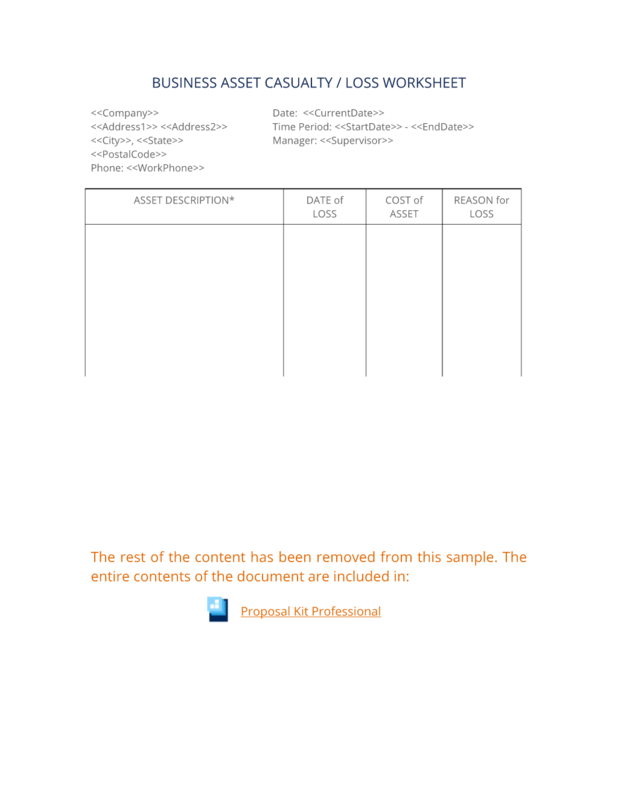 The editable Business Asset Casualty or Loss Worksheet document - complete with the actual formatting and layout is available in the retail Proposal Kit Professional.